(Joshua Paladino, Liberty Headlines) During a five-day enforcement action between Nov. 30 and Dec. 4, immigration authorities had to re-arrest 15 illegal aliens after local law enforcement released them due to sanctuary city policies. Local law enforcement agencies released the illegal aliens despite many of them having prior criminal convictions, U.S. Immigration and Customs Enforcement reported. ICE placed active detainers on all of the illegal aliens. Local law enforcement agencies, governed by sanctuary city policies, ignored the detainers and released the illegal aliens, despite their potential threat to public safety. Enforcement and Removal Operations Boston, a branch of ICE, area arrested 58 illegal aliens in total during the operation. ERO focused on immigration offenders who also have criminal convictions. Of the 58 illegal aliens ERO arrested, 30 “had prior felony convictions for serious or violent offenses,” while 33 have criminal charges awaiting trial. 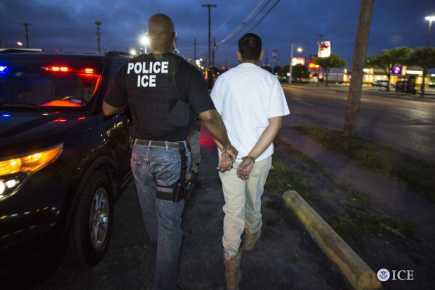 Another nine of the illegal aliens arrested had previously been deported from the United States. And four had “active Interpol Red Notices,” meaning a foreign government requested them for extradition due to an active warrant. Among the illegal aliens arrested were alleged and convicted drug dealers, murderers, robbers, and other criminals. ERO arrested two Brazilian nationals wanted for murder in their native countries. One of the men allegedly committed the murder by “casting a net over the victim and stabbing the victim 20 times,” ICE reported.